Actually the First Day of Christmas should have been last week when we visited the Lion’s Club at their encampment at the local Walmart and selected a tree. My Dear One went off to do errands, leaving me with the daunting responsibility of finding the best trees so that we could select the perfect one from among them. Our Lion-in-Charge told me which My Dear One would like best; darned if he wasn’t right. Once home we set the tree in a bucket of water on the patio where it was when the temperatures dropped and the snows came. We brought it in last night so that the block of ice that encases the trunk would melt, and fortified by lunch we wrassled that baby up the stairs and into the stand. Christmas is not a season that starts on the assigned anniversary of the birth of Jesus of Nazareth. It is a period that begins after the warm and undistracted enjoyment of Thanksgiving and continues through December 25 to whatever point that tree, ornaments and related frou-frou are packed away for another year. The first day of Christmas actually starts with general décor and ambience: candles for the windows, the crèche and various objets de Noël for the mantel, the sleigh for the dining-room table. Traditions are essential. 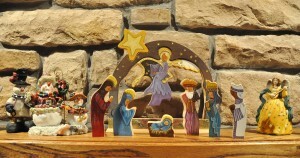 Despite my heathenish ways, I could not imagine Christmas without a crèche. Mine was made to order by an artist who has since gone on to join the angels. My only request was that Mary be garbed in celestial blue; now I cannot imagine the participants clad in anything other than the colors given them. 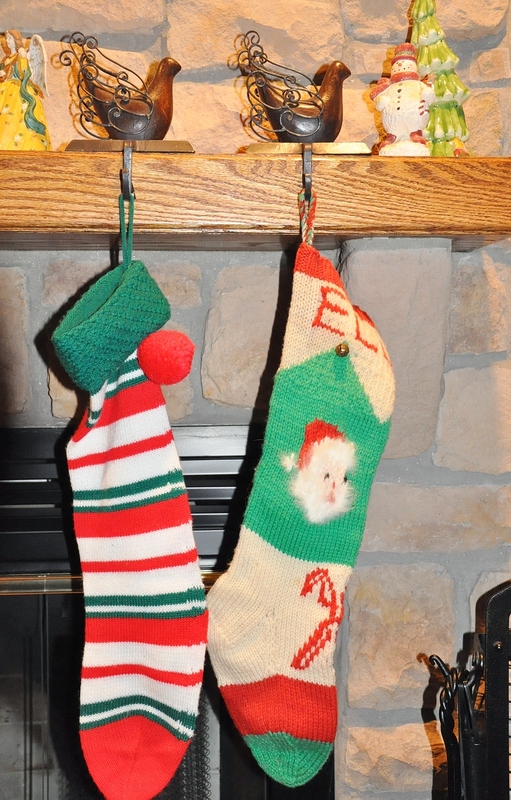 Each year it seems the real estate around the hearth gets more crowded; traditions accrue like barnacles in this household. 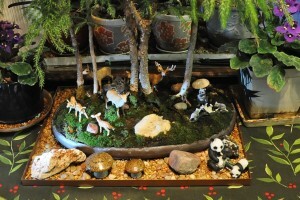 Then there is the restoration of the wildlife to the bonsai forest. The trees are descendants of the Norfolk Island pine that was once My Dear One’s personal Christmas tree. The parent pine for many years was brought into the living-room to be hung with red bows and gleaming bells for the holidays. That tree finally got so large—well over six feet high—and so ratty and unmanageable that it was given the coup de grâce. Before it departed for that great arboretum in the sky, its spawn found a home in a Japanese pot and settled into their landscape of moss and mini-boulders. A few years ago—I forget exactly how many—My Dear One made me a gift of a deer and fawns to celebrate the wildlife we had come to cherish. A buck, another doe and new fawns joined the original denizens of our little woodland; then a raccoon and a litter of rambunctious kits moved in. This year, a panda and her cub commemorate Mei Xiang’s ardent maternity and her babe, Bao Bao. 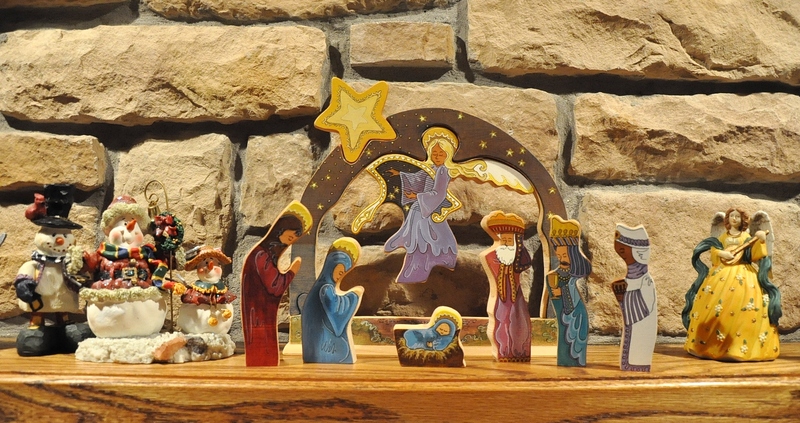 Could there be a more perfect nativity? Mid-afternoon I was ready to take on star, lights and garland of golden tinsel. There is a process, after all, to decorating the tree; today the foundations, tomorrow the ornaments. It is the best way. A week or so ago I realized that we had no star. 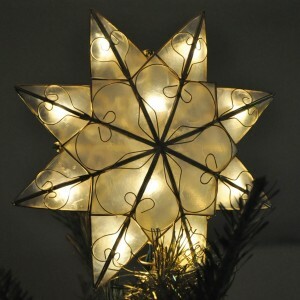 Last year the star simply croaked. That star replaced a star that met its end when Theo, then a kitten, was left home alone and brought down the Christmas tree while my then Un-Tattooed Boy and I spent Christmas Eve with Baba. The new star replicates the original rather than the successor—and that makes me happy in an odd way. I secured the star to the bent leader at the top, and began spiraling white lights through the branches, pushing them deep toward the trunk and allowing the last string to drape closer to the branches’ ends. My Dear One appeared and helped with the garland. Would there be enough? I had replaced the old tarnished strands with ones that glistened. Yes, just barely. It might be a good idea to acquire just one more length, just in case, dontcha know. The living room is now scented with pine, and the lights glow in the dark. But it is only the first day of Christmas. There are many more until the holiday is complete.